You are here: Home / Internet / How To Get Back Old Gmail Look? In recent days Google has been updating the appearance of Gmail, Adsense, Analytics, Blogger…, etc. Users can switch to new user Interface and checkout he cool new features added in it :). Some like the recent changes in Google and their new interface appearance and some don’t like new interface. They prefer the old appearance which is easier for them to navigate :). Personally I too don’t like Googles new appearance. But we need to adopt to new changes to go along with their wonderful service they provide to us ;). How to revert back to Gmail older look? Click on the Gear icon at the far right in the mail-navigation menu. 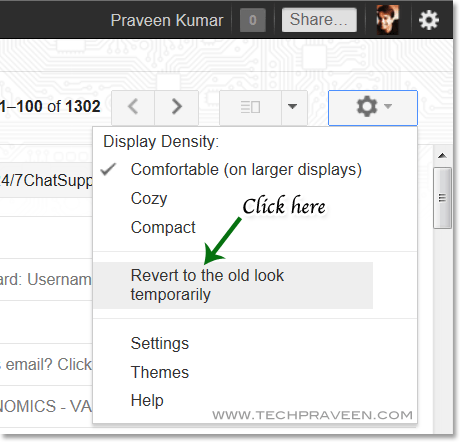 Click “Revert to the old look temporarily”. You’ll be redirected to the older version of Gmail. That’s it, you’ve reverted back Gmail older look temporarily. After switching to new look (& hating it) I am not seeing the menu you describe when I click the Settings gear icon. I just see ‘Mail Settings / Mail Help / Lab’ – how do I get a FULL menu display! Great blog post, thanks for sharing this blog. Keep it up! Oh thank God! I’ve been stuck with the new look and I don’t like how it turned out. I’ve been trying to revert it back but to no avail. thank you so much for sharing this! SO, I should use IE for this to work? Yup! I was shock when I opened my Gmail and all the settings was already different, not expecting it to happen without notice.Even the settings of the documents, I am used to the old one, I am much comfortable with it. so what I did is to explore and nothing seems right to what I did. Thanks for this post now I can change to the old one. Just some days agao a collegue of mine was complaining that she doesn’t like the new outlook, but she didn’t know how to come back. your post is what she needs. As for me I adore the new way they organized the mail as we need changes from time to time. I’m glad that you help me about this. Personally, I want the old gmail look because i can handle it fast rather than using the new one.